Around 800 leading representatives from marketing, media and agencies met on January 22–23 in Frankfurt, Germany, at the German Media Congress with the theme “Transformation—But Where To?” The very first speech was given by Karl-Theodor zu Guttenberg, former economics and defense minister and founder and chairman of Spitzberg Partners. His keynote speech was titled “World Order in Transformation” (Trumpet translation throughout). Guttenberg devoted a significant portion of his speech to criticizing United States technology companies, such as Amazon, Facebook and Google. But his real criticism was directed against the German government’s inaction against these companies. The future, he said, will be shaped by those nations that successfully merge technological advances with the right political system. According to Guttenberg, the world’s future can neither be left to the U.S. nor Communist China. He urged Europe to oppose China and to take America’s spot in transforming the world order. For this to happen, Europe must undergo some radical changes. Guttenberg warned that one cannot ignore the power that U.S. technology companies have worldwide. The numbers are enormous. “Facebook has 2.3 billion users,” Guttenberg said, despite all the “garbage” it produces. The U.S. has given its tech companies almost unrestrained license, and the result has been a dramatic power shift from politicians to the big-tech companies. Guttenberg characterized the power of companies (like Facebook, Google and Amazon) as posing a threat to the free democratic world order. He said the reaction by U.S. and European governments has often been marked by ignorance, panic or delayed uncreative actions. Guttenberg then asked if the government has more to offer than attempting to destroy or regulate these companies. A single nation cannot control “the cross borders reaching” Internet, he warned. But Europe currently doesn’t have much more to offer. As Europe fails to shape technological advances, another power player is entering the scene. China has taken a completely different approach from the U.S. by financing and increasingly nationalizing its booming tech sector. This has caused Chinese companies to flourish in an unprecedented way and, in some cases, surpass U.S. counterparts. “If one today hears someone in Germany say that he urgently needs to go to Silicon Valley, or ‘I need to send my co-workers to Silicon Valley,’ then I can only say, ‘Send your co-workers first to Shenzhen and then to Silicon Valley. Then you will also get an idea how the power shifts have occurred.’ These political power shifts reach far into the geological sphere,” Guttenberg said. China’s tech companies don’t hold the same power as their U.S. counterparts, but they do equip their government with enormous authoritarian power over its 1.4 billion people. China also uses this power to advance geopolitically. China’s influence is dominating Africa and even making bold inroads into Europe. Instead of relying on U.S. or European technologies, some EU members now rely on China to further their technological development. But these geopolitical advances, Guttenberg warned, are not of democratic nature, neither do they contribute to the free democratic order. Guttenberg blames the German government’s inaction and its China-friendly policy for this, and he demands the formation of a powerful European superpower to shape the emerging global world order. Considering America’s power and China’s dramatic rise, Guttenberg’s demand may seem like a pipe dream, but it is exactly what the Bible prophesies will happen. Guttenberg believes that two factors have led to China’s rise: technological development coupled with its political system. “As a result, we are seeing a power potential that we wouldn’t have expected just a few years ago,” he said. You can’t leave it with the politicians; you also have to discuss them in your platforms and publications. I believe this is lacking from time to time. And that’s a part of shaping the transformation in a direction where we say that we don’t let systems restrain us. Guttenberg is upset by Germany’s lack of leadership. He is upset that EU visionaries, like French President Emmanuel Macron, lack support. He is upset that progress is hindered by a political system of restraints. 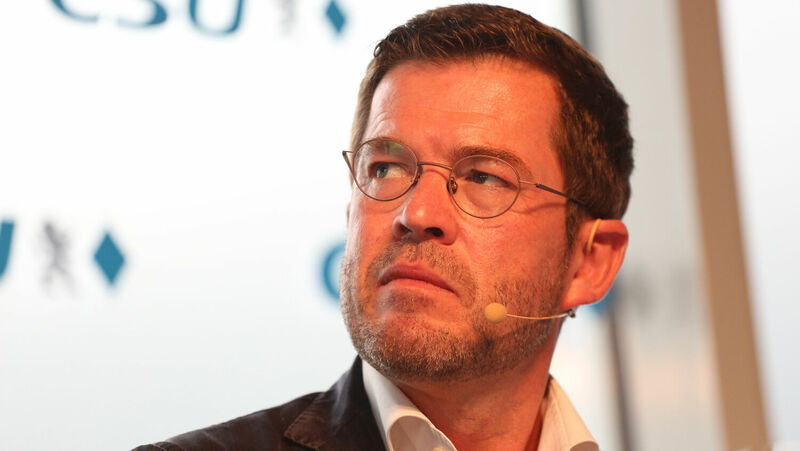 But more than just criticizing the government’s failures, Guttenberg urges Germany’s media to support a revolt against the system in which he himself once served. He believes that the entire system has to change dramatically before Europe can progress. Only when that system changes can Europe rise to unprecedented power. The most traditional perception of power is still the military. But the military accomplishments of the future will also occur in this framework. Those who have the advantage here are those who can combine artificial intelligence, big data analytics with supercomputing. China is leading the race before the U.S. Here again we see something that can cause one to tremble. He then urged Europe to stop using a China-friendly policy and to meet it on equal terms. But Europe can still win the race and take the leading role in these developments by taking advantage of the U.S.’s recent conflict with China and investing in its own industry. Getting this technological advantage will then lead Europe to become a military superpower. Our April 2019 Trumpet cover story, “Forging a Superpower,” shows how Europe, led by Germany, has the makings of a superpower, but it lacks a confidence-inspiring leader. Guttenberg sees Europe for what it is, and he believes that he can fill its enormous leadership vacuum. China, by itself, doesn’t have nearly the same potential as Europe, but with Xi at its helm, it is shocking the world economically, technologically and militarily. Imagine what would happen if Europe underwent a similar transformation, possibly by finding a middle ground between the political systems of the U.S. and China. Today, Guttenberg is pleading with Germany’s media to prepare the German consciousness for the need to change Europe’s political system. Daniel 8 prophesies that this dramatic political change is looming. We at the Trumpet believe Guttenberg will be the man to orchestrate that change. “And in the latter time of their kingdom, when the transgressors are come to the full, a king of fierce countenance, and understanding dark sentences, shall stand up. And his power shall be mighty, but not by his own power: and he shall destroy wonderfully, and shall prosper, and practice, and shall destroy the mighty and the holy people” (Daniel 8:23-24). Europe today is awaiting a strong leader who will turn the Continent into an economic and military powerhouse. Guttenberg’s attack on America’s big-tech companies is part of that geopolitical power shift in favor of Europe. The Bible reveals that a coming strongman will lead Europe to enormous power. Daniel 2:44 reveals that this European superpower will be the last world-ruling empire before Jesus Christ returns to Earth. Request your free copy of A Strong German Leader Is Imminent, by Trumpet editor in chief Gerald Flurry. In this booklet, Mr. Flurry explains the prophecies behind the rise of this strongman and how his rise will lead to the most wonderful news this world has ever heard.